BO's negative stats are amazing including those showing him losing the election to an unnamed Republican candidate. The problem occurs when you put any of the current nine Republican presidential candidates in the slot against him – BO wins these match-ups which will only be accentuated if conservatives stay home & protest instead of voting. Now before you say they are popular vote surveys & they don't count (as we vividly recall from 2000 – or did that one count more than we think?) – the electoral survey is even worse. 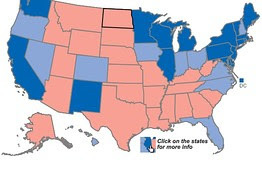 The dark blue states in the above map show the states that have voted Democrat in all of the last five presidential elections – these states total 242 electoral votes – only 28 short of the needed 270 to win the presidency. A similar analysis for the Republicans totals 102 electoral votes for the states that have voted Republican in all of the last five presidential elections. Hard to think America is a center-right country. Results of recent polls show that 50% of Independents think that government should do more to help meet people's needs while 44% think government should do less. When combining Independents & Democrats 51% are in the do more camp while 46% said government is doing too much already. Growing Latino populations in Arizona (11 electoral votes), Georgia (16), Texas (38), Colorado (11), & Florida (29) could secure the election for BO without even adding Ohio (18) which goes back & forth between the parties' nominees. Results of the same poll question indicate that Latinos in Colorado favor more government by 56% to 37% & in Florida by 52% to 40%. For the record its 59% to 30% in New Mexico. Now this looks like the deck is stacked against America. The idea that America can still challenge the statists obvious growing clout is best made if we spread the word articulated by Lt. Colonel Allen West (R, FL) who like Jon Voight & me believes that BO is intentionally destroying our economy. Congressman West recently said "It's intentional because that's who this President is. The President is a Marxist who believes in the separation of classes." As written so many times on this blog BO follows the Alinsky method of community organization, which of course is another danger in the above long list as BO organizes his base of blacks, Latinos, union workers, single women, & the youth vote to win one more for the un-Gipper. BO's community organization work plays directly against the mindset change that is needed to return America to the excellence of our founding principles. Our job is to convince people that less Government results in stronger economic growth and more jobs & that the current system is not sustainable as is. All of these stats should make it clear to people of substance that our way of life & standard of living is being stolen right out from under us by the political elites of both parties, who clearly recognize 51% of the electorate when they see it, & given to the poorest, least educated, most unskilled, unaccomplished, & laziest people you can imagine – this happens everyday to one degree or another. If this is important to you you should make sure that all of your friends, family members, neighbors, co-workers etc. know what is @ stake in November 2012 – namely the possible replacement of free market capitalism in America by socialism. The results of this approach aren't good either – over one third of Americans under thirty see nothing wrong with socialism. As BO continues to pretend that he is for America his anti-American plan continues to take hold. Americans who are being devastated by the powerful force of having no sense of hope in supporting themselves become more disenchanted with the capitalistic system that got them here every day – all per BO's design. This is a call to double or triple your efforts because it is just too important not to. We have the time to unstack the deck but we can't get started soon enough. Well said Doug. And kudos to Allen West for confronting common perception that BO is doing best he can but is weak in economics. We need more politicians like him. I agree, Latinos will vote for BO. Reason is very simple - most do not pay income taxes, as they do not earn enough money to pay. Why would they want gov't to cut spending. The more gov't spends on various welfare programs, the more they benefit. It is a win-win situation for them. Seeing Is Believing - Or Is It?